Verge coin is a decentralized cryptocurrency perfect for all those users who value security, privacy and anonymity. This particular coin implements features that enhance the blockchain Bitcoin itself like multiple anonymous-centric networks like Tor and i2p. There are many experts who are seeing this coin as one of the potential hits during the coming years. Verge coin has been around for a while and it also uses supports extensive mining algorithms to improve security and give a fairly equal distribution of coins to the miners. Aside from this, we can point out some features such as: Privacy, longevity, community support, fast transactions, adoption, open source. Verge is a cryptocurrency that is still valued low but it has grown a lot during these months, thanks to the general adoption of Bitcoin. Each transaction of Verge is governed by a large number of such servers, and once all servers complete their operation, each server clears the information that was left there. Thanks to this, once the transaction is complete, it is not possible to trace the I.P. of the sender and this means that their data cannot be revealed or checked. The Tor network ensures a shipment and receipt of funds much faster without the slow confirmation of the Bitcoin network and this is definitely a very attractive reason to use these coins. Tor and i2P can be used to perform transactions using the clients Electrum Verge, this is the IP addressing information, as well as the transactional information and will not be filtered to the servers that the client is also connecting to transact through this desktop client. The portfolio Verge Electrum comes with support multi-signature, which means that transactions may require you to authorize more than one key. Standard transactions are usually only going to require a signature, but for greater security, users may opt-out of multisig-based transactions. Verge also uses mining support through multiple algorithms. This hints to individuals with mining equipment could get involved, this gets things going with decentralization and easier distribution of the currencies between the miners and that is a great advantage. The Verge coin seems to be growing steadily. 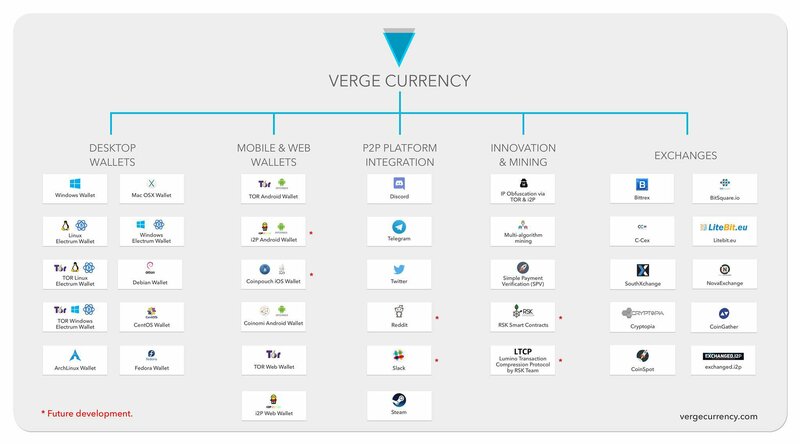 This is not to say that the competition is not fierce, but the amount of exposure given to coins like Verge is going to play a major role in the kind of results that people are able to get from their investments. We would always advise that people research as much as possible and learn all they can about cryptocurrencies and what they can do in terms of investment. This will allow them to get a much better idea of kind of potential that these coins have. Information is widely available on all coins, but understanding the intricacies behind them can be a bit more complex, so upgrading your knowledge and taking the process of learning as much as possible and with serious intent is going to be important if you want to invest safely and with enough information.